Before you mentioned that you mostly invest in startups based in Madrid and Barcelona. Do you see significant differences between the two markets? Yes, many differences and very clearly in favor of Barcelona. Entrepreneurship is very viral and Barcelona was fortunate to have in the 90s and 2000s the Intercom group, which has produced many entrepreneurs. The same happened with Privalia, as many employees who left ended up creating ecommerce businesses. Ecosystems feed themselves. This is like an anthill: in a garden you might not know where an anthill can emerge, but when there are a number of ants you know that’s the anthill. And in Spain we have a winner anthill and that’s Barcelona. A hub that we should take care of, instead of promoting the creation of pockets of entrepreneurship everywhere. Business Schools: they have been fundamental to attract people from outside Spain. A more sensible administration, because it is an administration more interested in supporting than intervening. And we must also recognize one more thing: Barcelona has positioned itself very well. When you are recruiting talent outside of Spain, if you tell a person “come to Barcelona” there’s a good chance that they will. If you ask him or her to come to Madrid they will think about it, and if you tell them “come to Spain” it is even less likely. Another factor contributing to the rise of Barcelona is that there is a lot less silliness than in Madrid. Silliness associated to politicians, to power, bullrings, ASCRI and lots of parasites. Madrid has a lot of parasites. Obviously not everyone in the administration are parasites, but Madrid has an overpopulation of people who do not contribute to the ecosystem. One more factor is that Madrid has not been able to build a central district of entrepreneurship. Much of the entrepreneurial activity in Barcelona is concentrated in the 22@ district while in Madrid many incubators are in the outskirts or far from the centre. You can’t ask an entrepreneur to work from Vicálvaro while politicians have their offices in the centre of the city. These are details that make no sense. Politicians should go themselves to Vicálvaro and leave their offices in Castellana to entrepreneurs, which is where they should be to take advantage of the city and the urban environment. In Barcelona there is less silliness and more entrepreneurs. We invest more in Barcelona than in Madrid, but many of the best projects are still in Barcelona. However, it’s worth pointing out that there’s a lot more money in Madrid than in Barcelona. Just a pile of stones, or a priceless window on to the past? It's a meticulous process: slow and labor intensive. The archeologist's tiny brush cleans away another microscopically thin layer of dirt to uncover a sliver of flint, and then marks the spot with a small red drawing pin. Between 200,000 to 300,000 years ago, another hand may well have uncovered this same piece of flint and tapped gently away at it, slowly creating an axe blade able to fell the mammoths that roamed the wetlands around the Jarama and Manzanares rivers in the southeast of the Madrid region, in what today is the dormitory town of Vicálvaro. With little in the way of tourist attractions, for Vicálvaro, this latest archeological discovery could be one way to attract more visitors, say both the United Left and Socialist Party, who have already campaigned to develop the necropolis as an open-air museum. Archeologists are exploring nearby, where they believe they have uncovered the remains of a small community from the same period. They want the regional government to put money into developing the sites. Government officials are planning to build thousands of housing units on the site of a necropolis that dates between the fifth and eighth centuries A.D., when the Germanic Visigoths ruled what is now Spain. The cemetery held the remains of 1,500 people, who must have lived in a nearby city whose location is unknown. Before construction begins, archaeologists will search the area for traces of the settlement, which they believe must be no farther than a mile from the necropolis. Opposition politicians have demanded the site be preserved, but the regional government has so far refused to grant it protected status. It doesn't have a name yet, but there is a search party out looking for it. It is the city that produced the 1,500 bodies found in the Visigothic necropolis of Vicálvaro, which the Madrid government has earmarked for destruction because it has "no relevance." The remains are thought to date back to between the fifth and eighth centuries AD. Over this early burial site on an enormous dry plain, right next to the highway to Valencia, the Madrid government is planning to build a total of 15,400 housing units. But before construction begins, regional authorities have granted permission to look for further traces of the people who once dwelled in these parts. 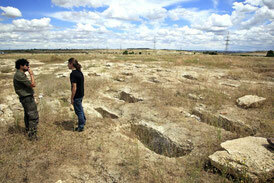 And while scholars search for the missing Visigothic city, its cemetery continues to deteriorate. On this three-hectare lot, most of the 824 graves are covered with brush and poppies. Just half-a-dozen of them, the ones furthest from the road, still preserve their Visigothic marks - smooth flat stones that delineate their perimeter. 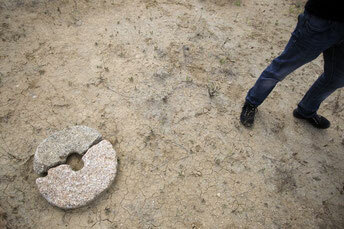 There are also a few bones, millstones and other types of stones piled up beside the graves. The burial site is located on a stretch of whitish limestone that gave rise to the former name of Vicálvaro, Vicus Albus (white village). Jorge Vega, the head of the team that found the necropolis, talks about the town that they are looking for. "It can't be very far, just one or two kilometers," he says. "We have already marked out an area, but we have to get to it. We'll get started soon." Vega says the Vicálvaro discovery is "very valuable" because it provides insight into life in the region many centuries ago. "The general state of the necropolis was not very good," he adds. "When you open a grave, because of the weather conditions, it soon starts to deteriorate. They are rather hard to maintain in good condition, but there are elements that could definitely be preserved." The regional government has rejected the idea of preserving the site on the basis that there are 60 others like it in the region, all dating from the same period, and all more accessible than the Vicálvaro cemetery. Two of them have already been turned into museums. If construction work on the apartment blocks had already begun, this controversy might not even exist. The new Historical Heritage Law, approved last Thursday with the sole support of the ruling Popular Party (PP), eliminates the need for preventive archeological reports on planned construction sites, making it legal to build over historical sites that are not already officially registered as such. The opposition and the region's archeologists believe the new regulation is tailor-made for the massive Eurovegas casino and entertainment project scheduled to be built in the capital. On Monday, the Socialist Party demanded that the Vicálvaro necropolis be preserved. The city says it will do whatever regional authorities decide (both are ruled by the PP), but in February the PP's representatives on the city council refused to ask the region to declare the site a Bien de Interés Cultural - heritage of cultural interest - which would afford some degree of legal protection. United Left representative José Gordo says authorities should turn this place into a museum "so that anyone who wants to can go visit it. At the next local festival there will be games for kids and talks to raise awareness about the site." This area has also yielded remains from Roman times, the Middle Ages, the era of Islamic rule and other periods of Spanish history. "The definitive reports are not finished yet, and we still need to run DNA tests, but we can already state that this was the necropolis for a nearby population center of around 500 individuals," explains Vega. "We have not yet found any warriors, which means it was likely a community of farmers." Saúl Martín, one of the archeologists who participated in the nearby dig at Los Berrocales, confirms that 16 centuries ago Vicálvaro was already a blue-collar district, just like it is today. "They were workers. We didn't find any spectacular buildings or lavish grave goods," he says during a visit to the Vicálvaro site. "They were likely Hispanics who adopted Visigothic customs," says Vega about the early inhabitants of Vicálvaro. "Ethnically they were not Germanic peoples." The dig chief also says that some of the human remains will be analyzed at a Danish university and others at a Spanish one to extract their DNA. Teeth will be examined to find out what these people ate. The village was made up of houses with half-buried walls and a wooden roof. There might have been a church, but it would likely have been taken apart during the Arab invasions. "That's another interesting element that we want to find." Inside the sarcophagi, archeologists found burial items made up of earrings, rings and brooches, which were transferred to the Regional Archeological Museum in Alcalá de Henares. The graves are organized by families, "forming little groups," explains Vega. The coffins were made of wood with bronze nails, and all graves were carved along an east-to-west line, to mark sunup and sundown. Loud chants rise up from the street below, the noise bouncing off the wall of the building across the way and pouring in to an apartment on the top floor of a block in Vicalvaro, a working class suburb of Madrid. "The people, united, will never be divided!" yells the crowd, angrily waving banners and placards. "To fight is the only way!" The scores of people gathering on the sidewalk are no nosey neighbors -- indeed, many of them are complete strangers to the family living on the fifth floor -- but they are all here to protect Rocio from eviction. But then the global financial crisis hit, bringing Spain's economy to its knees; Rocio lost her jobs -- in a shop, and as a cleaner -- and the mortgage payments spiraled out of reach. She is an example of the crisis many Spaniards face as the country deals with the highest unemployment since the Civil War in the 1930s, and a recession entering its second year. For a while, Rocio got by on benefits, but then those stopped too, and now the bailiffs are circling. "They are about to evict me, and I'm fighting to stay because I don't have anywhere else to go," she says. "I haven't paid my mortgage because I can't -- I don't have any work." Inside the cosy two-bedroom apartment, there's little sign that the family may be turned out onto the street at any moment: The TV is on in the lounge, shelves and closets are full, and a piece of meat sits on the kitchen counter top, defrosting in time for tonight's dinner. In the main bedroom, there's just one concession to the very real threat that Rocio might be about to lose her home: a large black suitcase sits, empty, atop a bedspread dotted with pink roses. "I can't stand the thought of living on the streets with my son, but I have no idea where else to go," she says. "Just thinking about it makes me very sad." Rocio's story is echoed by others all over Spain: the global financial crisis knocked the bottom out of the country's housing market and sparked a major recession that left thousands jobless. The country's unemployment rate stands at 26% -- its highest level ever -- and the situation is even worse for young people, with more than 55% of 16 to 24-year-olds out of work. Tomas Rodriguez is one of those who lost his home. The 33-year-old used to work in a grocery store, but was made redundant when the company got into trouble. Now he sleeps in Madrid's Plaza Mayor, a tourist hotspot by day, and cardboard city peopled by the homeless at night. "I was able to get unemployment benefits, but time has run out," he says. "I can't afford to pay for things, so now I'm living on the street... It's hard, but that's the way it is." Rodriguez says the financial crisis has left many ordinary Spaniards homeless: "People are losing their jobs. Now they can't pay their mortgages, they can't provide for their families, they struggle. "People have an image of the homeless that is not real -- they see somebody with a box of wine and they think we're all like that, [but] that's not the case... Even people with degrees are living on the street. Nobody is safe." It is this fear that has driven many Spanish people to action -- compelled to act by what they see as the gross unfairness of everyday life in Spain in 2013, where struggling citizens are evicted, even as hundreds of homes lie empty. Dozens of those gathered outside the door of Rocio's apartment block are supporters of "Stop Desahucios" (Stop Evictions), part of the Platform of People Affected by Mortgages (PAH) a group which campaigns to prevent banks and authorities turfing those hit by the country's economic woes out of their homes. "For every eviction, an occupation!" they shout, accusing the banks and authorities of "real estate terrorism." "The next eviction should be at the Palace of Moncloa! [the Spanish prime minister's official residence]" runs another chant; a few short years ago, most Spaniards would have shied away from such overtly political protests. Activist Dante Scherma, 24, says Spain's troubled history had left many wary of becoming involved in political issues: "Forty years of Franco's dictatorship made people disconnect from politics." But when simmering anger and resentment about the government and the economy gave way to the mass marches of the 15-M movement -- also known as the "Indignados" -- the floodgates were opened. In 2011, thousands of Spaniards took to the country's streets, inspiring the global "Occupy" movement with their protest camp in Madrid's Puerta del Sol. "Citizens were not used to speaking out on political issues. My parents never discussed politics with me, but now that is changing. The movement awoke a lot of people who were not interested in politics before." Scherma agrees: "The 15-M movement made people talk about social issues, and about politics in normal conversations -- in cafes, restaurants, bars -- where before they only talked about football or fashion." Nowadays, Madrid is a city of protests -- it is almost impossible to cross the capital without coming across a sit-in or a march, petitions are everywhere, and the activists have returned to the Puerta del Sol. "We use the social networks to communicate," explains de Roa, brandishing her smartphone. "This is the tool that has permitted us to fight together, and to feel that we are not alone." Their subjects are anything and everything -- from education reform to job losses, government cuts to corruption -- but all reflecting a widespread dissatisfaction with politicians and their handling of the country's economic crisis. "They are destroying our future," says college student Alejandra, as she participates in a march in support of public education. "We know there's a crisis, but it could be less if they managed the money better. "All the political parties do is accuse each other, the government is destroying the country, and the conditions for workers are getting worse and worse." On Saturday, February 23, all these individual groups are expected to unite for rainbow-hued mass demonstrations in towns and cities across Spain, known as the "Marea Cuidadana" (Tide of Citizens). Back in Vicalvaro, the moment of truth has arrived, but the crowd -- now shouting at the police, insisting they should be ashamed of themselves for helping to evict families -- appears to have had an impact. Rocio is summoned downstairs, as lawyers from the PAH explain that she will be able to stay -- for a while at least. For those working to stop Spain's eviction epidemic, today has seen a small and temporary victory: The bailiffs have been put off for now, but Rocio knows they may yet return.